The Washington Street neighborhood is an extraordinary location in the history of immigration and ethnic life in the United States and New York City. This one thoroughfare and surrounding streets on the West Side of Lower Manhattan, next to the Financial District, was a microcosm of the diversity of New York City in the late 19th and early 20th centuries, including immigrants from Lebanon, Syria, Palestine, Greece, Turkey, Armenia, Moravia, Slovakia, Poland, Hungary, Lithuania, Ukraine, Germany and Ireland. 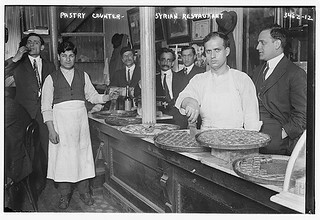 Because of the important Syrian presence (the largest proportion of whom came from areas we would label Lebanon today, Mount Lebanon in particular) that began to coalesce in the 1880s, it was often referred to as “the “Syrian Quarter,” or “Little Syria,” and was the “mother colony” of the Greater Syria diaspora in the United States. Most of the first immigrants were Christians and there were four churches on Washington Street. 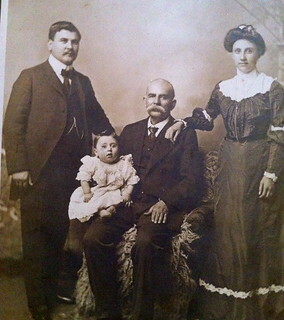 Later immigrants included Muslims from Palestine, North Africa and other parts of the Middle East. For visitors, Washington Street was strikingly different and unique among ethnic neighborhoods. The stereotypical differences were often remarked in New York newspapers. A strong aroma of Arabic coffee was supplemented by sights of red fez hats, tastes of sweet pastries, and signs and sounds in Arabic. In this era, many Americans were fascinated by Middle Eastern culture, and many ventured down to Washington Street to get a taste of the Middle East, where restaurants served Syrian food and stores sold exotic products. The first Arab immigrants peddled notions, fancy goods or religious objects but soon became suppliers themselves and became prosperous importers and exporters. Others set up factories to manufacture kimonos, cigarettes, or other products, employing hundreds of their fellow emigres. Starting in the 1890s, the families of “Little Syria” moved to nearby Brooklyn neighborhoods of Brooklyn Heights and Atlantic Avenue, and they would travel to and from Washington Street (where their businesses remained) via the South Street Ferry. Washington Street also had a major impact on global culture. The Linotype typesetting machine was adapted for Arabic print by the brothers Naoum and Salloum Mokarzel for their Al-Hoda newspaper (The Guidance), enabling significant growth of the Arabic media and journalism in the Middle East as well as in New York. Moreover, many important Arab writers, including Khalil Gibran,,Ilya abu Madi, Mikhail Naimy and Ameen Rihani, and , lived or were active in the neighborhood. In 1916, reestablished in 1920, they founded a group called “Pen League,” which had an important impact on Arabic literature, introducing Western literary formats and ideas to Arabic writing. By the second decade of the twentieth century, Lebanese and Syrian Americans had become fully assimilated into the American way of life, and many had become successful throughout the country. With restrictive changes to American immigration law in the early 1920s, fewer newer immigrants arrived to replenish the immigrant cohort and maintain the authenticity of Washington Street. Highrise construction in the 1920s and 30s began to break up the tenements and old low-rise businesses, and, in 1946, eviction notices were distributed to the residents of Washington Street for Robert Moses’s plans to construct the Brooklyn Battery Tunnel. The later construction of the World Trade Center demolished much that remained and put the nail in the coffin for Washington Street as an ethnic enclave. Eventually, Washington Street would be almost fully erased of its physical reminders except for a handful of buildings that activists have been trying to preserve for over a decade.